Greg Saumure, GS Hair’s namesake marked over 2 decades in the salon industry before opening GS HAIR in 2006. An alumnus of the Vidal Sassoon Academy in Santa Monica, CA, Greg carries coveted Vidal Sassoon credentials. Known as the ‘Harvard of Hair’ to industry professionals. At Sassoon, the focus was not just hair, but on art, fashion, trend prediction and even bone structure. As Greg puts it, ” Beauty is so much more complex than your basic cut and color”. As a former Educator and Platform Artist for Paragon and Goldwell International, he passes on his finely tuned skills for the technical application of color. Greg has spent 3 decades building his loyal client base. He has trained hundreds of area hairstylists -right out of school into thriving careers. His commitment to education, honesty and professionalism help him build one of Sacramento’s best styling teams. 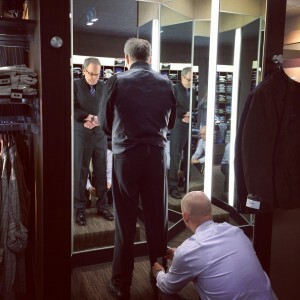 Now, Greg is putting his focus squarely where it belongs, on his fabulous clients.